Welcome to the protestant church Temple Neuf ! The Lutheran Church Temple Neuf („New Church“) is dedicated to make accessible the biblical experience of learning faith. Its history. From 1248 to 1531 the site of today’s Temple Neuf was Strasbourg’s Dominican monastery, then a major hub for German (or Rhineland) mysticism. It was here that Meister Eckhart (here from 1313-1324) and his disciple John Tauler led this late medieval renewal of Christian faith, emphasizing preaching, Christ, and direct contact with God through prayer. Many scholars tie this movement to the later Reformation. You can find still Tauler’s tombstone, which shows him preaching, at the back of the nave. Like many free cities of the Holy Roman empire, Strasbourg joined the Reforming movement spearheaded by Martin Luther. As early as 1523, Cathedral priest Matthew Zell began to preach a Lutheran understanding of the Gospel. On site of today’s Temple Neuf, formerly the Dominican Church, John Calvin served as pastor of Strasbourg’s first French-speaking Protestant community in 1540-41. 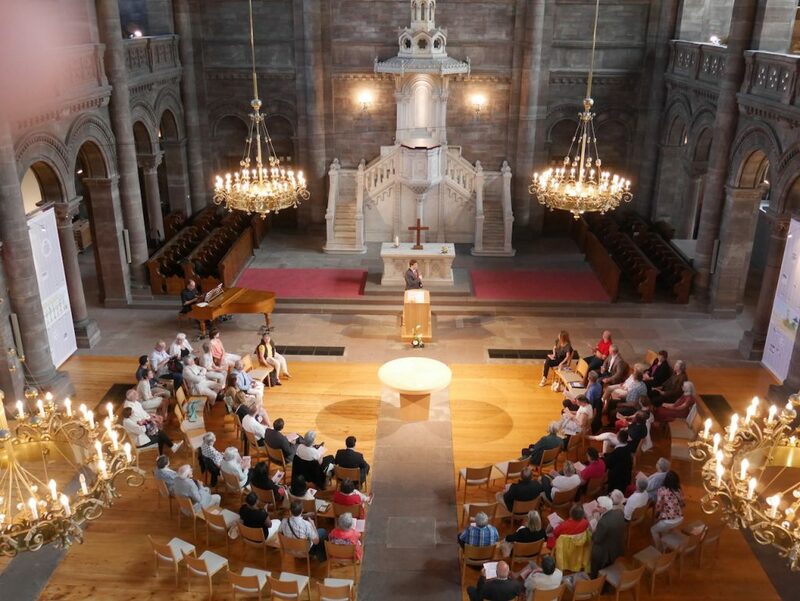 After the 1555 Peace of Augsburg, Strasbourg – a free city of the Empire – opted definitively for Protestantism ; the Cathedral became the principal Lutheran church in 1561. 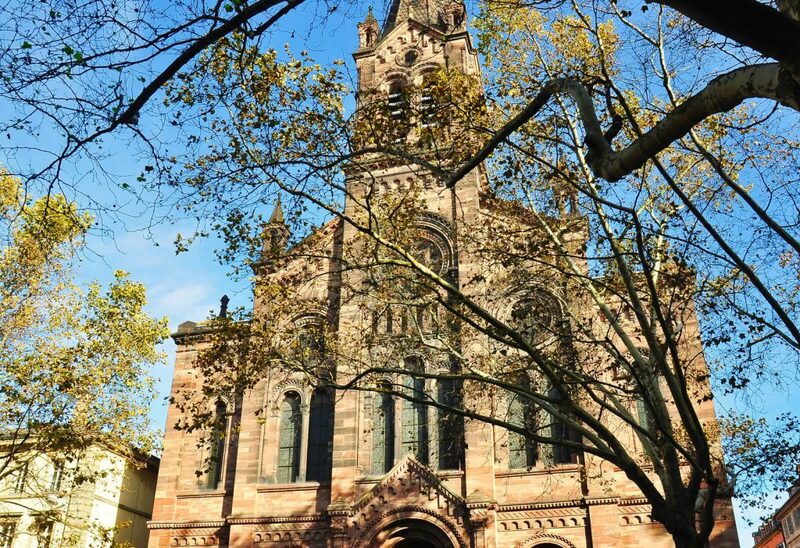 After Louis XIV of France annexed Strasbourg in 1681 and returned the Cathedral to the Roman Catholics, he gave the displaced Protestant parish the former Dominican convent, which they renamed «New Church» (Temple Neuf in French). The repurposed church became the place for one of organ-builder J. A. Silbermann’s most accomplished instruments in 1749. From 1590 to 1870 Strasbourg’s Library was located in the former choir of the former Temple Neuf. With over 400.000 items it was the second largest library in France at the time. During the Franco-Prussian war, on the night August 24-25, 1870, an errant shell set Temple Neuf afire, reducing the Church and the library with its entire collection to ashes. Many unique documents were destroyed, among them 3,446 manuscripts, the most celebrated being the Hortus Deliciarum, an encyclopaedia of medieval knowledge compiled in the twelfth century under the guidance of Abbess Herrade of Landsberg. The loss was irreparable. After the bombardment of 1870, Temple Neuf was rebuilt (1874-77) using local pink sandstone in the Neo-Romanesque style. Each weekend Temple Neuf is home to four worship services. On Friday evenings we meet for an hour of ecumenical prayer and reflection together with the Catholic parish of the Cathedral (French). On Sunday morning there are lively Lutheran-Reformed services (French) ; on each first Sunday, we have an ecumenical Evening service. Sunday afternoons Temple Neuf is home to the local Malagasy Lutherans (Malagasy/French). On Sunday evenings the evangelical Liberté ! Church holds its bilingual worship (French/English). In addition to this rich worshipping life Temple Neuf hosts a constant stream of concerts, expositions, and cultural activities.